This is the public profile of Jifei Ou, Additional information and high-resolution images are available for accredited press members, to access additional information about Jifei Ou please login as a press member. About Jifei Ou : Jifei Ou (欧冀飞) is a designer, researcher and PhD candidate at the MIT Media Lab, where he focuses on designing and fabricating transformable materials across scales (from μm to m). Physical materials are usually considered as static, passive, and permanent. Jifei is interested in finding ways to redesign physical materials with the characteristics of digital information, such as the ability to change shape and and to be programmable. 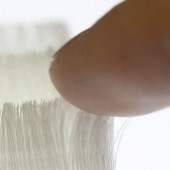 Such new materials could be used to construct a responsive living environment, accelerate the process of design and manufacturing, and enhance our existing interaction with products. As much as his work is informed by digital technology, he is inspired in equal measure by the natural world around him. He has been leading projects that study bio-mimicry and bio-derived materials to design shape-changing packaging, garments and furniture. Press Members: Request an exclusive interview with Jifei Ou.